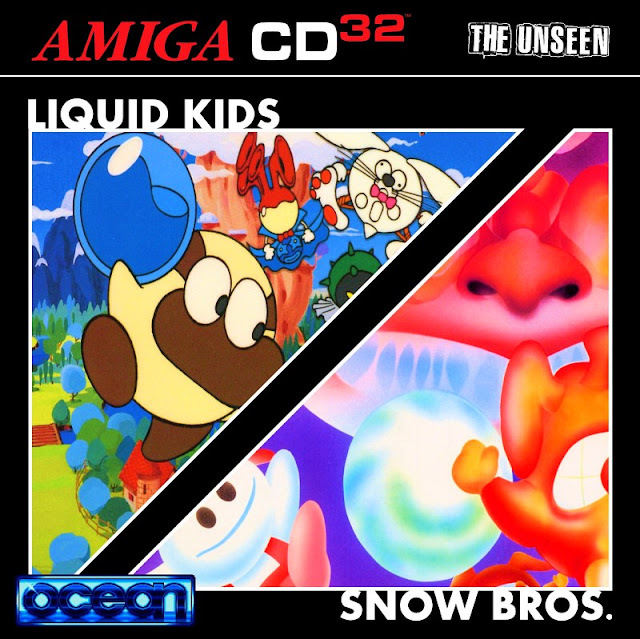 Amiga Jay is really giving Earok a run for his money, in terms of Amiga CD32 releases, as he has converted with the help of CFOU, the Liquid Kids & Snow Bros double pack for the Amiga CD32. Both of these games are full of Arcade fun and have hours worth of enjoyment that originally never saw an Amiga release, at least not until both were found by the community and made available in the early 2000's. Snow Brothers for example is a brilliant game by Ocean France, as it has full scrolling nearly arcade perfection and goes to prove that the Amiga could handle arcade style games as long as it was being done by the right people. It is just a shame it never officially saw a commercial release, as the Amiga community would've lapped it up as a highly collectable item. As for the final game in the double pack, Liquid Kids. It's not as good as Snow Brothers and isn't up to the same standard of polish as some earlier Ocean France arcade to Amiga conversions. But it's still a decent Arcade platformer overall, and really suited to the Amiga CD32. So there you have it, that's two games, you really should be playing right now!